In the past I’ve written that Full Text Searching has the ability to index documents stored in a VARBINARY(MAX) field. However, I have never really gone into any details on how to do this. Today I will remedy that by demonstrating how to Full Text Seach not only using a VARBINARY(MAX) field, but one that has been stored using FILESTREAM. Even though these examples will be done against the data we’ve stored with FILESTREAM over the lessons from the last few days, know that this technique is identical for binary objects stored in a VARBINARY(MAX) field without using FILESTREAM. Let’s start by creating a catalog to hold our Full Text data. Here you can see I am indexing two fields. The first is the “DocumentName”, which is passed in as the first parameter and looks like other examples. We won’t actually be using it in this example, however I included it to demonstrate you can index multiple columns even when one of them is a VARBINARY(MAX) column. The second parameter indexes the VARBINARY(MAX) “Document” column itself, but notice the TYPE COLUMN after the column name. In order to Full Text Index a VARBINARY(MAX) column you must also have a column with the file extension in it. You then pass in the name of column after the TYPE COLUMN. In this example, the document extension is stored in the “DocumentExtension” column. Since the document extension can be stored in a column with any name, we let the Full Text engine know which column by passing it in after the TYPE COLUMN keyword. The remainder of the command is like other examples I’ve shown in the past. Now we can run a normal SELECT…CONTAINS query against the “Document” field. I’ll leave it to you to run, for me it returned one row, with “TheTamingOfTheShrew.doc”. If you want to try it again, use “Elinor”, and you should get back “KingJohn.doc”. This will give you a list of all file extensions understood by SQL Server. Each row actually represents a filter. Each filter represents a DLL that implements the IFilter interface. It is possible to add additional filters to the system. For example, Microsoft offers the “Microsoft Filter Pack”. You may have noticed that out of the box SQL Server 2008 supports the older Office 2003 documents, but not the more recent Office 2007 formats. To add these newer formats to your SQL Server, Microsoft provides the afore mentioned filter pack. While installing it is beyond the scope of this aritcle you can find complete instructions for downloand and installation at http://support.microsoft.com/default.aspx?scid=kb;en-us;945934 . The Full Text Search features provided by SQL Server continue to amaze me with how powerful they are, yet how easy they are to implment. With the information here you can easily search through documents stored in a VARBINARY(MAX) field, even when those documents are actually stored via the new SQL Server 2008 FILESTREAM. In the previous entry we covered how to upload a file to SQL Server using the FILESTREAM, new to SQL Server 2008. In this post we will look at retrieving a file from SQL Server using FILESTREAM. If you missed yesterday’s installment, a simple front end was created, the full project can be found at the Code Gallery site http://code.msdn.microsoft.com/FileStreamFTS . The grid is a Data View Grid that shows the ID and Document information from the table we previously created. (If you want to see the code to populate the grid see the project.) The user picks a row, then clicks on the Get File button. The code is very simple, the heart of it is the FileTransfer.GetFile static method. 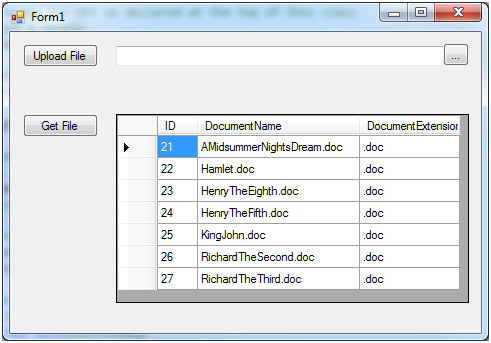 Two values are passed in, the integer ID, which is the primary key from the database, and the path to save the file to. Here I simply hard coded a path, in a real life application you will want to give the user the ability to enter a path. Let’s take a look at the GetFile routine. // part of the FILESTREAM. // in order to get a handle. // stream using it’s Write feature (shown below, commented out. // fileBytes lines and uncomment the outputStream line. // Finally we should commit the transaction. The routine kicks off by opening a connection, then establishing a transaction. Remember from the previous lesson that every time you work with a FILESTREAM it has to be in a transaction. Next we basically duplicate the SQL used in the previous lesson, returning the path name, transaction context, and document name. The only difference is we pass in the ID as a parameter. With that, just like with the previous example we call the OpenSqlFilestream API. Note a difference, in this example the second parameter is “DESIRED_ACCESS_READ” as opposed to the write access we indicated previosly. I simply eliminate the local byte array and write the buffer directly to the disk. Either way, the remainder is simple, just closing all the streams, commiting the transaction and closing the database connection. This concludes the series on how to use FILESTREAM, in future posts we look into how to do Full Text Search with FILESTREAM stored objects. The best way to work with documents in a database is via a .Net application. I created a simple Windows forms project to access the table I created in previous lessons. I named the application FileLoader, you can the entire project at the Code Gallery site http://code.msdn.microsoft.com/FileStreamFTS . The real line of importance is the FileTransfer.UploadFile. This calls a static method in a class I named FileTransfer.cs. In order to use FILESTREAM there is an API call we have to make, so at the header area of the FileTransfer we have a lot of declarations. These are pretty much a straight copy from the MSDN help files. //of BLOB access that is needed by the application. //can be called in the Main() method below. //This statement imports the Win32 API GetLastError(). // to extract the extension and name. cmd.CommandText = "INSERT INTO "
+ "(DocumentExtension, DocumentName) VALUES (‘"
+ fi.Extension + "’, ‘"
// Now upload the file. It must be done inside a transaction. cmd.CommandText = "SELECT Document.PathName(), "
First we open a connection to the SQL Server, then create a FileInfo object to make it simple to extract the file name and extension. Next a record is inserted into the database that will act as a place holder. It has the name of the file and the extension, but no file yet. I did go ahead and open a FileStream to the source file, located on the disk. We’ll need this later to upload the file. Next you will see that I begin a transaction. Every time you work with a FILESTREAM it must always be in the context of a transaction. After that a SQL Data Reader is created that has three pieces of information. First, it calls the PathName() function for the Document field in our table. The PathName() will be needed later when we call the API. The second field is returned from the GET_FILESTREAM_TRANSACTION_CONTEXT function, and returns the transaction context for the transaction. Note this is not the name (in this example “mainTransaction”), but the context which is a special value. These two values are then copied into local variables which will be used in calling the OpenSqlFilestream API. In this example I also retrieve the DocumentName field, this is used by the code when it writes the file to the database, but is not strictly needed for the FILESTREAM. Next you will see the call to the OpenSqlFilestream API, which returns a “handle”. This handle is then used to create a FileStream object. Using this newly created FileStream (here named dbStream) we can then upload the file. Now the main work begins. After setting up a buffer, we then simply read from the source file stream into the buffer, then write the exact same buffer to the database FileStream. The loop continues until there are no more bytes in the source. At this point we are essentially done. We close the streams, commit the transaction, and in the finally block close the SQL database connection. The file should now be in the database. I do want to point out one thing. In the SQL to get the information to the row just uploaded, I use a subquery to get the max(id), essentially returning the last row just inserted. This is fine for this simple example, when the database has just one user. In your production systems where you are likely to have many users, however, you should use an alternate method to return the row you need. Otherwise two users could insert rows at the same time, and thus a conflict could occur with both of them getting back the same max(id). It will not happen often, but at some point it could happen and be very hard to debug. This handled the uploading of files to the SQL Server via FILESTREAM, in the next installment we’ll look at how to retrieve the file we just uploaded.